One of the limitations of the known ale yeast strains is that they do not function satisfactorily in worts having plato values (°P) higher than about 14.5°P and values of only about 9°P to 12°P are usually required. The plato value (°P) is defined as the weight of dissolved solids, expressed as a percentage, in water at 15.6°C. Generally, the higher the plato value at which a yeast strain will function, the greater is the conversion of fermentable substrate to alcohol for a given volume of wort. Consequently, the resultant fermentation product would be one of higher than usually desired final alcohol content and would generally be diluted before packaging. Since the dilution to obtain a standard, commercially acceptable product would occur at the end of the brewing process, the overall throughput of such a brewing system would be substantially increased over a conventional system. Furthermore, beers produced from such high plato worts generally exhibit improved colloidal haze and flavour stability. In view of the economic advantages possible in fermenting worts of higher plato values, there has been a substantial amount of research carried out in the hope of obtaining a yeast strain which will function at such higher plato values in the range of about 16°P to 18°P, i.e. a yeast strain which will remain in the body of the wort until substantial or total conversion of the fermentable sugars to alcohol atthe higher Plato values has occurred. As an alternative, attempts have been made to maintain known yeast strains in the body of the wort by mechanical means, such as continuous stirring, in the hope thatthe yeast would continue to function if maintained in contact with the wort. However, this has proved to be inefficient and in many cases more expensive because of the extra energy required to operate such mechanical means. Furthermore, many such attempts have been frustrated by difficulties of product flavour match with present commercially acceptable standards. Thus, according to one aspect of the present invention there is provided a brewing process wherein a malt wort is prepared; fermented with brewers' yeast; and, following completion of the fermentation, finished to the desired alcoholic brewery beverage; the improvement comprising fermenting said wort having a Plato value of about 14.5 or greater with a strain of the species Saccharomyces cerevisiae brewers' yeast having the NCYC No. 962. In another aspect the invention provides a brewing process for producing ale, wherein a hopped, 30% corn grit adjunct wort is prepared having a Plato value of from about 16°P to 18°P; fermented at a temperature of about 21°Cfor about 3 to 5 days with a species of Saccharomyces cerevisiae brewers' yeast; and, following completion of the fermentation, finished to the desired ale; the improvement comprising fermenting said wort with a strain of the species Saccharomyces cerevisiae brewers' yeast having the NCYC No. 962. In a further aspect the invention provides a biologically pure culture of a brewers' yeast strain of the species Saccharomyces cerevisiae having the NCYC No. 962, said strain having the ability to ferment high Plato value worts of 14.5 or greater and the ability of flocculate to the bottom of the fermentation vessel when attenuation is substantially complete. In a further aspect of the invention provides a method of manufacturing a novel brewers' yeast strain, wherein a yeast strain is propagated in an oxygenated nutrient medium, the improvement comprising propagating a biologically pure culture of a yeast strain of the species Saccharomyces cerevisiae having the NCYC No. 962. The advantage of the yeast strain of the present invention (referred to herein as strain 962 for the sake of convenience) is that it has both bottom-cropping characteristics as well as the ability to ferment high specific gravity worts. The bottom-cropping characteristic is advantageous because of increased utilization in the brewing industry of large conical-based vessels for fermenting the wort, and bottom-cropping is especially facile in such vessels. Thus strain 962 is particularly well adapted for use with continuous brewing techniques as well as batch-wise brewing. Thus, while a number of bottom-cropping ale strains are known, the dual characteristics of bottom-cropping and the ability to ferment which gravity worts makes strain 962 of the present invention especially useful in the brewing of ale. The specific morphological and physiological characteristics of strain 962 are set out below. It should be noted, however, that the strain is definitely an ale strain rather than a lager strain according to classicial yeast taxonomy in that it cannot completely ferment the trisaccharide raffinose (fructose-glucose-galactose) because the organism lacks the requisite enzyme, melibiase (as described by J. Lodder, in "The Yeasts"; North-Holland: Amsterdam ). This is also confirmed by the fact that the beer produced by strain 962 is considered by taste panelists to be an ale which compares most favourably to the presently available popular commercial ales. Figure 8 is a graph showing the effect of the pitching rate on the flocculation characteristics of the novel yeast strain of this invention under static fermentation conditions in an 11.8°P wort. (i) the incubation of the plates was four weeks at a temperature of about 21°C. As illustrated in Figure 1(a), morphologically the giant colony of the novel strain may be described as being a circular colony having a slightly serrated periphery, a convex surface topography with a central, globular dome. Furthermore, the surface topography consistently exhibits primary concentric convolutions and secondary radial convolutions which, in combination, impart a rough appearance to the surface. In colour, the colony appears matte cream to light beige. Figures 1(b), 1(c) and 1(d) are three additional photographs of two other ale strains and one lager strain of genus Saccharomyces for comparison. Figures 1 (b) and 1 (c) show the giant colonies of the ale strains and Figure 1 (d) illustrates that of the lager strain at a magnification of about 6x. Single colonies of strain 962 may be subcultured using standard slant culturing techniques. A medium found very satisfactory for this type of culture was a malt-yeast extract-glucose-peptone (MYGP) medium prepared according to the method described by L. J. Wickerham, in Technical Bulletin No. 1029 (1951), U.S. Department of Agriculture. The incubation temperature and period were as described hereinbefore for the production of giant colonies. Single colonies so produced were stored at about 4°C. Long term maintenance of subcultures is carried out satisfactorily by conventional techniques, such as storing the so-produced organisms under liquid nitrogen or lyophilizing the organisms and storing same at room temperature. Flocculence was measured under conditions very similar to the static (no agitation) fermentation encountered in brewing. The yeast was pre- cultured at about 21°C in a hopped wort containing about 30% corn adjunct, prepared by general procedure well known to those skilled in the art, and then inoculated into about 16 litres of identical wort in a 20 litre unstirred glass fermenter, unless otherwise stated. An inoculation level of about 0.25% wet weight of cells (about 1.35x10' viable cells/millilitre) was used in all experiments together with an incubation temperature of about 21°C unless stated otherwise. Sequential wort samples were taken throughout the course of the fermentation and the specific gravity and concentration of yeast in suspension determined, by standard methods, on each sample. The fermentability of the wort with each yeast under study was determined by incubating about 200 ml of wort with approximately 4 grams of the yeast strain in a 300 ml flask on a New Brunswick Gyrotory Shaker at about 150 r.p.m. at approximately 21°C for about 72 hours. Unless otherwise stated 11.8°P hopped wort was used (about 30% corn adjunct). The difference between the original gravity and the gravity after shaker fermentation represents 100% attenuation (fermentability) for the wort and yeast strain in question. 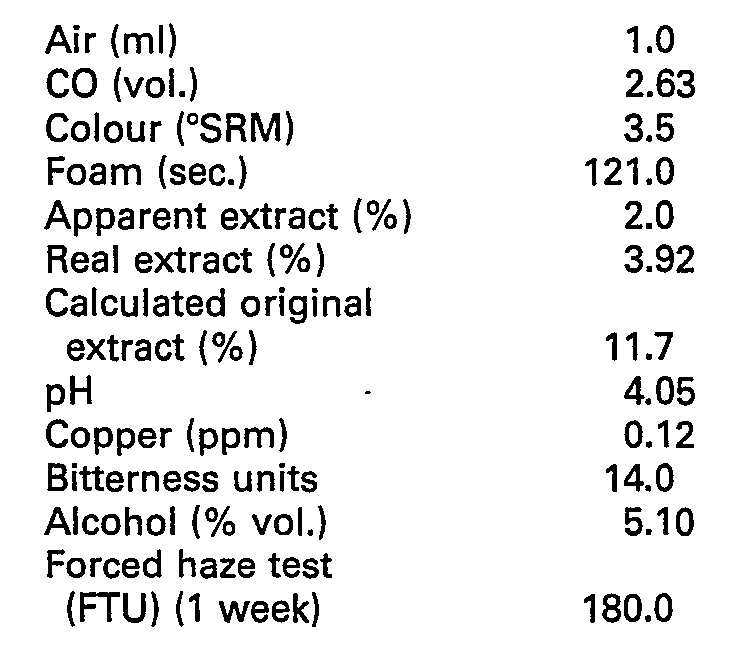 As stated hereinbefore, experimental conditions were adhered to which resembled as closely as possible the commercial, static fermentation environment in that the yeast was precul- tured in wort and then inoculated into approximately 16 litres of hopped wort at about 21°C in a 20 litre unstirred glass fermenter. The results are shown graphically in Figure 2, wherein the concentration of yeast in suspension is plotted against the percentage attenuation of the wort. In Figure 2, strain 1 is a lager strain while strains 2 and 3 are top-cropping ale strains. The yeast strain of the present invention, as noted above, is designated as strain 962. All of the other strains are maintained in the culture collection of the assignee and have been ascribed arbitrary identification numbers for the purpose of this specification. From Figure 2, it may be noted that ale strains 3 and 962 were able to ferment the wort substantially completely leaving little yeast in suspension at the end of fermentation. It is noteworthy that the yeast strain of the present invention did not flocculate to any significant extent until the wort had been almost completely attenuated at which point flocculation occurred at a very rapid rate. Among the advantages realized by the rapid rate of flocculation are that the occurrence of off-flavours due to yeast autolysis is minimized and the removal of the yeast from the fermented wort is obviously facilitated. Additionally, Figure 2 illustrates the versatility of the present strain in that it functions very well in even the normal range of wort specific gravity. The ale strain 2 fermented the wort to about 93% attenuation whereas the lager strain 1 fermented the wort to about 81 %. The under attenuation exhibited by strains 1 and 2 were the apparent result of premature flocculation of the yeast. Figure 2 shows that even in a 13.8°P wort some of the yeast strains are induced to flocculate too soon leaving a significant quantity of unfermented extract. The effects of higher gravity worts were studied in some detail by utilizing worts with gravities ranging from about 12°P to 18°P. The flocculation characteristics of three strains of yeast are shown in Figures 3 to 5, in which, as in the case of Figure 2, the concentration of yeast in suspension is plotted against the percentage attenuation of each wort. Figure 3 shows that although strain 4 satisfactorily fermented out a 14°P wort, fermentation in 16°P and 17°P worts resulted in premature flocculation and only approximately 80% of the fermentable extract was attenuated. This strain illustrates the general trend exhibited by many ale yeast strains and some, although less frequently, lager strains. While in the case of both lager strain 5 (Figure 4) and ale strain 962 (Figure 5) increasing wort gravity generally resulted in greater quantities of yeast remaining in suspension, the lager strain 5 was unable to completely ferment out the high gravity wort. That is, at 18°P, the concentration of yeast strain 5 in the suspension was about 0.4% (w/v) with a final attenuation of only about 80% whereas the same gravity wort fermented by strain 962 provided values of about 0.5% and 95%, respectively. Additionally, approximately half the yeast population of strain 5 had flocculated out at about 73% attenuation of the 18°P wort. The data shown in Figures 3 to 5 also suggest that in high gravity worts a greater proportion of the total yeast population becomes non-flocculant and remains in suspension con- committant with an apparent loss of its ability to ferment wort sugars. Presumably it is the ability to ferment maltotriose that is decreased since, as is well documented in the literature, unfermented maltotriose is invariably present in "sticking" or "hanging" fermentations. The reason(s) for this observation is not clear and is, in any case, not essential to the understanding of the present invention. However, the amount of increased yeast remaining in suspension in higher gravity worts as shown in Figures 3 to 5 can be removed by standard methods of extracting yeast, e.g. by centrifugation. It has also been well documented in the literature that the incubation or growth temperature during the growth of certain yeast strains will influence the strains' flocculation characteristics. In order to determine this influence of incubation temperature, a number of ale and lager yeast strains were cultured in wort of the type and in the manner defined above and the fermentation and flocculation characteristics were again examined in a 20 litre static fermenter with 12°P wort at about 15°C, 21°C and 32°C. The results are shown graphically in Figure 6 wherein, as before, the yeast in suspension is plotted against percentage attenuation of the wort. 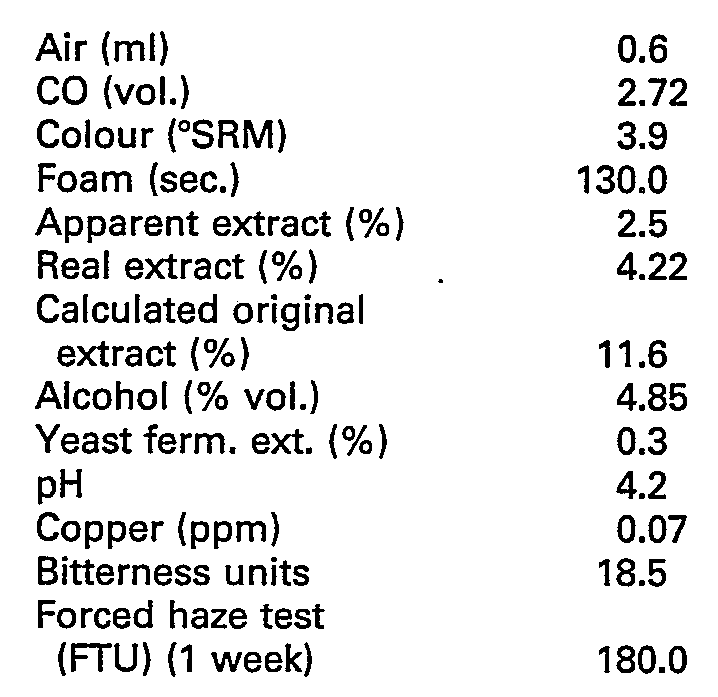 From this series of experiments it was noted that neither ale strain 3 or 4 grew to any significant extent when cultured at about 15°C and as a result (see Figure 6) comparatively little yeast in suspension accumulated. At the end of the fermentation period both of these strains attenuated the. wort to about 60% to 75% of its potential attenuation. At the higher temperatures of about 21°C and 32°C ale strains 3 and 4 exhibited greater growth and delayed flocculence with increased temperature. In contrast, the lager strain 1 grew well at 15°C. With an increase in temperature, this lager strain also exhibited an increased ability to multiply and delay its flocculation. It is obvious from Figure 6 that lager strain 1 was much less affected by incubation temperature than ale strains 3 and 4. The effect of temperature on yeast flocculation would appear to be strain dependent and as in many other situations each strain must be considered as a separate entity although generalization between groups of species or strains, such as lager and ale, can be made. As a result of this study it is possible to note that while most strains of Saccharomyces cerevisiae fail to grow well below about 20°C when compared to strains of Saccharomyces uvarum (carlsbergensis), the bottom-cropping ale strain 962 which taxonomically is classified as Saccharomyces cerevisiae, exhibits an ability to grow well at about 15°C and 32°C which is a trait generally more indicative of lager strains than ale strains. These results agree generally with reports in the literature which show that strains of Saccharomyces uvarum (carlsbergensis) grow well over the range of about 8°C to 30°C but not above about 36°C whereas strains of Saccharomyces cerevisiae have a maximum growth temperature of about 44°C with poor growth below about 18°C. The effect of the yeast pitching rate on fermentation and flocculation in static fermentation was studied with a number of ale strains and since the results generally were similar, only those obtained using strain 962 will be discussed and considered representative (see Figures 7 and 8). From Figure 7 it may be seen that reduction of the pitching rate from about 0.25% to 0.125% (w/v) wet weight in an 11.8°P wort containing about 30% corn adjunct had the effect of producing a slight initial lag phase but following approximately 72 hours fermentation the two fermentations exhibited quite similar characteristics and both attenuated the wort well with very little yeast left in suspension. This initial lag phase became increasingly pronounced as the pitching rate was decreased. Not only was the initial lag phase more pronounced at pitching rates of about 0.06% and 0.03% (w/v), but there was a concurrent substantial reduction in the total yeast growth as seen most readily in Figure 8. It is also noteworthy that, again as seen in Figure 8, a decrease in pitching rate resulted generally in premature flocculation which in turn resulted in incomplete attenuation of the wort. A corn grit adjunct was prepared in a cereal cooker by heating the corn grits in water at about 71°C for about 10 minutes. The adjunct material was then brought to boil and introduced into the mash mixer and combined with regular brewing malt which had been heated in water at a temperature of about 48°C for about 20 minutes in proportions sufficient to achieve a wort having about 30% corn adjunct. The mixture so formed was heated at about 67°C for about 30 minutes and thereafter at approximately 77°C for about 5 minutes. Using standard lautering procedures, about 529 hectolitres of wort were obtained and introduced into the kettle where hops were added and the kettle contents boiled for about one hour. The hops, as well as other trub components such as proteinaceous matter, were then separated from the wort which was cooled, oxygenated and pumped to a fermenter to achieve about 1460 hectolitres of approximately 16.4°P and having a temperature of about 17°C. Yeast strain 962 was added in an amount of about 400 gram/hectolitre and the heat generated by the respiration of the yeast was used to increase the temperature to about 21°C, termed "free-rise" in the art. The fermentation was allowed to proceed at a constant temperature of about 21°C, maintained by cooling, for a period of about 48 hours. The attenuated wort so obtained exhibited a plato value of about 2.9°P. Thereafter, the fermenter contents were cooled and treated utilizing standard brewing procedures and techniques to finish the ale. 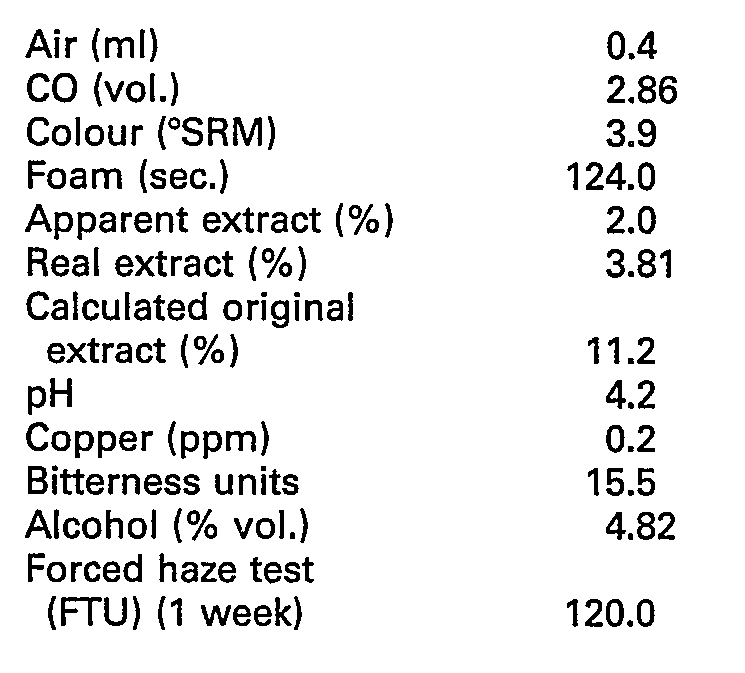 Dissolved oxygen-free water was introduced into the ale after final filtration to reduce the alcohol content from about 6.8% by volume to 4.85% by volume. Using the procedure detailed in Example 1 above, approximately 1460 hectolitres of a hopped, about 30% corn grit adjunct wort having a plato value of about 14.0°P were prepared and introduced into a fermenter, whereafter 300 gram/ hectolitre of yeast strain 962 was added to effect the "free-rise" and fermentation. The wort was fermented for about 72 hours at about 21°C to about 2.4°P. The fermenter contents were then cooled and treated using standard brewing procedures and techniques. Following the final filtration, oxygen-free water was included in the beer to reduce the alcohol content from about 5.8% by volume to 4.82% by volume. Evaluation of this ale by a taste test panel, as detailed in Example 1, showed there was not significant difference between it and the presently most popular commercial Canadian ale. By the process described in Example 1, about 490 hectolitres of a 12.0°P, hopped, about 30% corn grit adjunct wort were prepared. Following introduction of the wort into the fermenter, yeast strain 962 was added in an amount of 300 gram/ hectolitre. The temperature was raised to about 21°C by "free-rise" and the fermentation of the wort was then carried out at about 21°C. The wort was fermented for about 72 hours to about 2.2°P. Thereafter, the fermenter contents were cooled and processed by standard brewing procedures and techniques to produce a finished ale having an alcohol content of 5.10% by volume. 2. In a process as claimed in claim 1, wherein the wort to be fermented was a Plato value of up to about 18°P. 3. In a process as claimed in claim 1, wherein the said yeast is added to said wort in an amount of from 0.125 to 0.25 g/100 mi. 4. In a process as claimed in claim 2, wherein the said yeast is added to said wort in an amount of from 0.125 to 0.25 g/100 ml. 5. In a process as claimed in claim 1, 2 or 3, wherein the fermentation temperature is about 21°C. 6. In a brewing process for producing ale, wherein a hopped, 30% corn grit adjunct wort is prepared having a Plato value of from about 16°P to 18°P; fermented at a temperature of about 21°C for about 3 to 5 days with a species of Saccharomyces cerevisiae brewers' yeast; and, following completion of the fermentation, finished to the desired ale; the improvement comprising fermenting said wort with a strain of the species Saccharomyces cerevisiae brewers' yeast having the NCYC No. 962. 7. A biologically pure culture of a brewers' yeast strain of the species Saccharomyces cerevisiae having the NCYC No. 962, said strain having the ability to ferment high Plato value worts of 14.5 or greater and the ability of flocculate to the bottom of the fermentation vessel when attenuation is substantially complete. NL9100050A (en) * 1991-01-11 1992-08-03 Heineken Technische Beheer Bv Process for the continuous preparation of wort. NL8201785A (en) 1983-08-01 A process for the preparation of alcohol-free drinks with yeast aroma. Owner name: STUDIO CONS. BREVETTUALE S.R.L.